Risk for Injury: Vulnerable for injury as a result of environmental conditions interacting with the individual’s adaptive and defensive resources, which may compromise health. Instead of being viewed as a major public health problem, injuries have been recognized as inevitable accidents that happen in our daily life. However, a considerable epidemiological and medical study has shown that injuries, unlike accidents do not occur by chance. Like any disease, the risk of injury follows a predictable pattern, thus making them preventable. 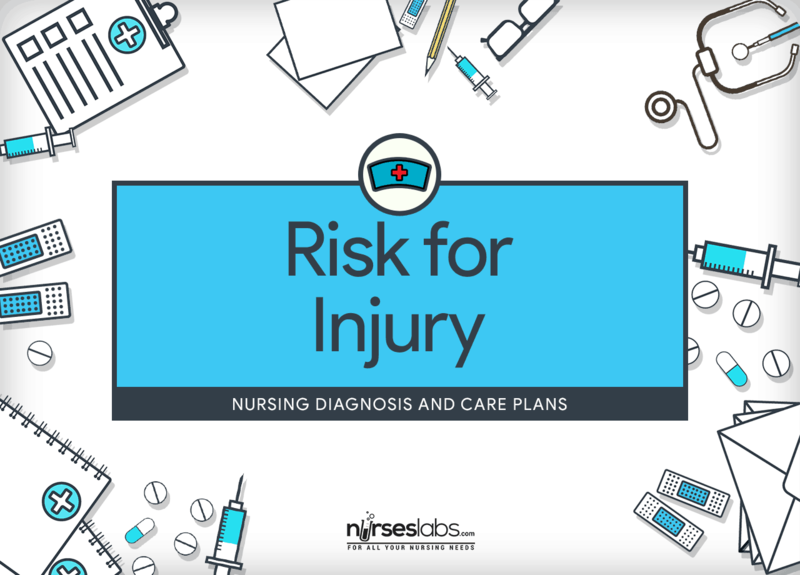 Implementation of favorable injury prevention program is an important part of nursing care in any healthcare setting and needs a multifaceted approach. Nurses also have a significant role in educating patients, families, and caregivers about the prevention of falls beyond the care continuum. Patient remains free of injuries. Patient explains methods to prevent injury. Patient identifies factors that increase risk for injury. Patient relates intent to practice selected prevention measures. Patient increases daily activity, if feasible. A detailed assessment that identifies the individual’s risk factors for injury. This will assist with clinical decision-making by indicating which interventions should be included in the care plan. Assess general status of the patient. This is to determine the patient’s condition that may cause injury. Assess mood coping abilities, personality style that may result in carelessnes. Mood coping abilities and style of personality aid to determine the patient’s level of cooperation. Recognize racial/ethnic diversity at the onset of care. Discovering race/ethnicity issues will enhance communication, establish rapport, and promote treatment outcomes. Evaluate the importance of cultural beliefs, norms, and values on the patient’s perceptions of risk for injury. What the patient considers risky behavior may be based on cultural perceptions. Determine whether exposure to community violence is contributing to risk for injury. Exposure to community violence has been associated with increases in aggressive behavior and depression. Check on home environment for threats to safety: clutter, improper storage of chemicals, slippery floors, scatter rugs, unstable stairs and stairwells, blocked entries, dim lighting, extension cords across pathways, hazardous electrical or gas connections, unsafe heating devices, inappropriate oxygen placement, high beds without rails, extremely hot water, pets, and pet excrement. Patients experiencing impaired mobility, impaired visual acuity, and neurological dysfunction, including dementia and other cognitive functional deficits, are at risk for injury from common hazards. Thoroughly conform patient to surroundings. Put call light within reach and teach how to call for assistance; respond to call light immediately. The patient must get used to the layout of the environment to avoid accidents. Items that are too far from the patient may cause hazard. Avoid use of restraints. Obtain a physician’s order if restraints are needed. If patients are restrained, they can sustain injuries, including strangulation, asphyxiation, or head injury from leading with their heads to get out of the bed. These are alternatives to restraints that can be helpful for preventing falls and injuries. Provide medical identification bracelet for patients at risk for injury from dementia, seizures, or other medical disorders. Signs are vital for patients at risk for injury. Healthcare providers need to acknowledge who has the condition for they are responsible for implementing actions to promote patient safety. If patient is notably disturbed, consider using a special safety bed that surrounds patient. If patient has a traumatic brain injury, use the Emory cubicle bed. Special beds can be an efficient and useful alternative to restraints and can help keep the patient safe during periods of confusion and anxiety. Ask family or significant others to be with the patient to prevent him or her from accidentally falling or pulling out tubes. This is to prevent the patient from accidentally falling or pulling out tubes. Eliminate or drop all possible hazards in the room such as razors, medications, and matches. This is to prevent the patient from any unpleasant experience due to dangerous objects. Avoid extreme hot and cold around patients at risk for injury (e.g., heating pads, hot water for baths/showers). Patients with decreased cognition or sensory deficits cannot discriminate extremes in temperature. Place an injury-prone patient in a room that is near the nurses’ station. Such placement allows regular observation of the patient. Use culturally relevant injury prevention programs whenever possible. The Make It Safe program is a bilingual, culturally sensitive educational presentation for Hispanic families that focuses on living and working safely in a rural environment. Validate the patient’s feelings and concerns related to environmental risks. Validation lets the patient know that the nurse has heard and understands what was said, and it promotes the nurse-patient relationship. Aid patients sit in a stable chair with armrests. Limit use of wheelchairs and geri-chairs except for transportation as needed. Patients are likely to fall when left in a wheelchair or geri-chair because they may stand up without locking the wheels or removing the footrests. To ensure propulsion with legs or arms and ability to reach the floor, ensure that the chair or wheelchair fits the build, abilities, and needs of the patient, eliminating footrests and minimizing problems with shearing. The seating system should fit the needs of the patient so that the patient can move the wheels, stand up from the chair without falling, and not be harmed by the chair or wheelchair. Limit the use of wheelchairs as much as possible because they can serve as a restraint device. Most patients in wheelchairs have limited ability to move. Wheelchairs can be effective restraints. Also, studies found that no residents could unlock the wheelchairs without help, wheelchairs were not fitted to residents, and residents were not trained in propulsion. Coordinate with physical therapist for strengthening exercises and gait training to increase mobility. Contact occupational therapist for assistance with helping patients perform ADLs. Gait training in physical therapy has been proven to effectively prevent falls. Educate patient about safety ambulation at home, including the use of safety measures such as handrails in bathroom. Patient’s knowledge about his or her condition is vital to safety and recovery. For patients with visual impairment, educate him or caregiver to label with bright colors such as yellow or red significant places in environment that must be easily located (e.g., stair edges, stove controls, light switches). Lighting an unfamiliar environment helps increase visibility if the patient must get up at night.